Maui youth work development program receives support… Mahalo to our youth program partners! Kahului, Hawaii: Akaku Maui Community Media was awarded a $3,000 grant from the Fred Baldwin Memorial Foundation to help support the youth work development program, Maui Youth Now, and a $5,000 donation from the Andrew S. Coburn Charitable Fund to support the Akaku Youth Media Exchange (AYME). 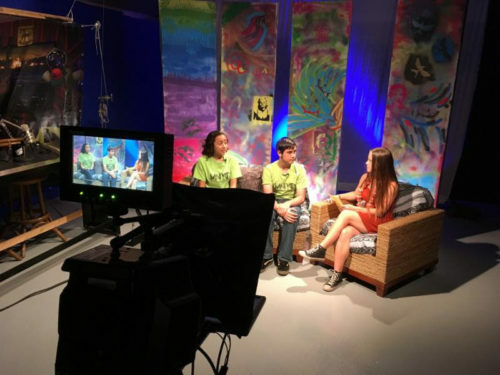 Maui Youth Now was designed for participants of Akaku’s Youth Media Exchange (AYME) to expand their field journalism skills to include broadcast studio production training through work development mentoring. Akaku leverages their professional broadcast studio and staff to offer young media trainees work experience and a stipend producing an episodic youth show that broadcasts on Akaku 55 and is available on Vimeo, also called Maui Youth Now. AYME offers work development in field production for alumni of Akaku’s youth mobile journalism training. The programs highlight engaging youth in 21st Century work skills, working independently as well as a group with peers from different backgrounds, and civic engagement emphasizing communication, critical thinking, problem-solving, teamwork, collaboration, and professionalism. Maui Youth Now is also supported by Maui Electric and earlier this year won an award from the West Region Alliance for Community Television in Sacramento. In the last five years, Akaku has provided over $15,000 to young people who have produced a wide variety of community video content and broadcast over 40 studio shows. Akaku leverages staff, equipment, and facilities with community partners to help bring these opportunities to Maui youth, if you’d like to help support or partner with Akaku’s youth programs, please contact kat@akaku.org or call 283-7961. ← LIVE General Election and Block Party on AKAKU TV Tuesday, November 6, 2018 from 6pm-11pm – You’re Invited! !